The premium price for cashews makes them an occasional treat for many people. But the pedigree of this nut-like seed might help justify the expense. The cashew, known botanically as Anacardium occidentale, is the seed of a tropical evergreen shrub related to mango, pistachio and poison ivy. Originating in Brazil, the cashew plant made its way to India and East Africa in the 16th century via Portuguese sailors. Commercial growers in the 21st century cultivate cashews in warm, humid climates across the globe, with Vietnam, Nigeria, India, Brazil, and Indonesia among the top producers of 23 cashew countries. Cashews are harvested by hand. The seeds of most fruits grow within the flesh, but the cashew seed hangs from the bottom of a cashew "apple," essentially a swollen stem. A hard shell with two layers encases the kidney-shaped cashew seed. Between these two layers lurks the phenolic resin urushiol, which is the same substance that causes the blistering rash seen after contact with poison ivy and poison oak. The shelling process removes this substance, which gets used in the making of such products as varnish, insecticide, paint, and even rocket lubricant. Because of the potential toxicity, cashews are never sold in the shell. Fresh cashew apples taste delicious, but only growers and people living near cashew orchards get to enjoy the fruit because it is highly perishable. Cashew apples begin to ferment immediately after they're picked and last barely 24 hours, thwarting any attempt to bring them to a global market. Highly prized in their growing locale, though, cashew apples can sometimes be found canned, in jams or as the base of a liqueur. Commercial producers in Brazil and India package the juice for regional sale. The cashew tree itself does not go to waste as the wood is milled into lumber used to build shipping crates and boats. How Do You Eat Cashews? You might see cashews labeled "raw" in the supermarket, but all cashews undergo some heat in the process to remove the shell and caustic substance. Cashews sold as "roasted" have been cooked twice—once during the shelling process and then roasted to deepen the color and enhance the flavor, sometimes with salt. 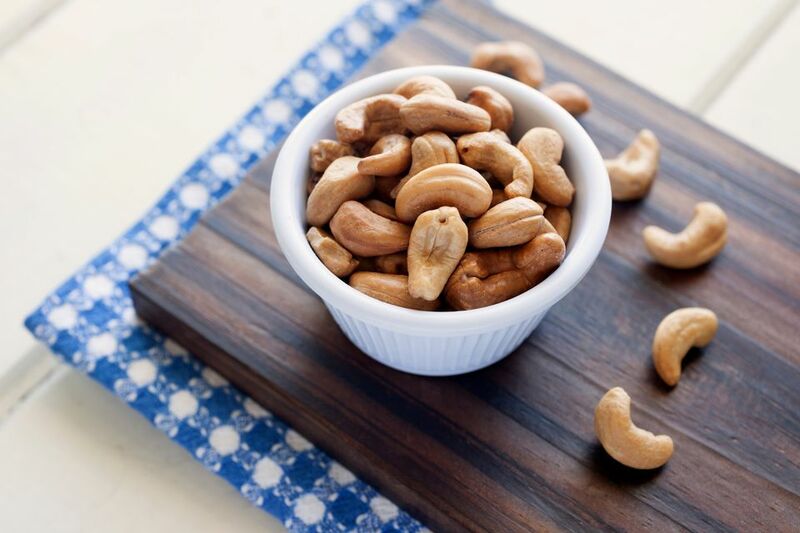 Because they are high in heart-healthy monounsaturated fatty acids, cashews make some superfoods lists for their concentration of protein, fiber, minerals, and antioxidants. Though technically a seed, the cashew generally gets the culinary treatment of a nut. You can buy them whole to eat as a snack out of hand or pureed into butter for use as a spread or smoothie ingredient. Pressed cashews yield a light- to dark-yellow oil better used as a salad dressing ingredient or finishing oil than a cooking oil. It also has cosmetic applications as a skin moisturizer and carrier oil for aromatherapy treatments. Asian and Indian cuisines frequently include whole or chopped cashews as a stir-fry ingredient and in curries. Vegan cooks turn cashews into animal product-free milk, cream, mayonnaise, butter, and cheese.